In Graffiti: Vandalism, Street Art and Cultural Significance, the authors first present a study wherein a political dimension of art was analyzed using Jacques Rancière’s theory, the micropolitical context in contemporary cities was analyzed using Michael Foucault’s theory, and the research methodology was based on the urban ethnography of Italian author Massimo Canevacci. They present the experiences of five graffiti writers, exposing themes of resistance against societal rules. Next, the books examine an event that happened during a graffitti workshop with youths in a city in the South of Brazil. The attempt to draw graffiti on a school’s white wall, seen by the youths as transgression towards the institution and its rules, brought about a variety of reactions. The security guard reprimanded them, and the pedagogical coordinator listened to them, but also mentioned the possibility of asking the director’s permission. After listening to the youths’ arguments and negotiating the image which would be drawn, the director ended up allowing the graffiti to be created. 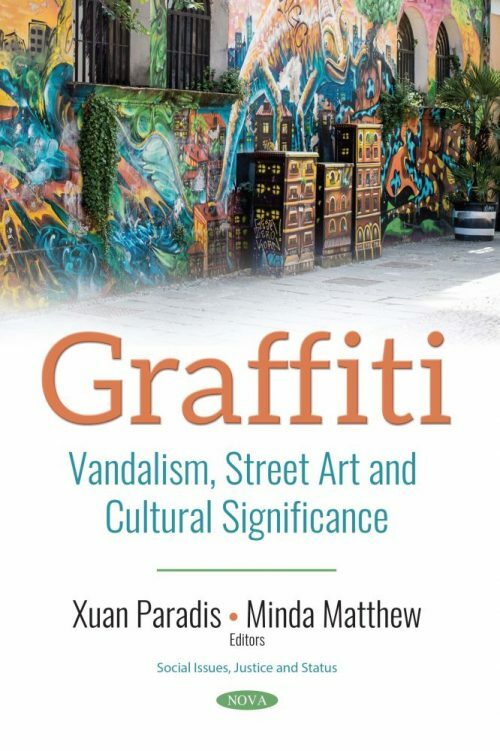 Next, the authors present a study on graffiti art in a skate park in Malta, with the goal of exploring some of the functions the artworks serve. The skate park authorizes graffiti in an attempt to create “safe spaces” for young people aimed at engaging them in creative, recreational activities they enjoy doing. The authors suggest that graffiti art in designated spaces could potentially reverse the association of graffiti with social unrest, fear, vandalism and crime. Following this, the book analyzes graffiti and street-art production of the extreme right-wing groups in Slovenia. The authors state that modern fascism is direct, exclusive, and aggressive, while postmodern fascism has the potential to be even more dangerous, because it looks inclusive, conciliatory, and its diction seems integrative. The concluding study explores the efficiency of the laser cleaning of graffiti spray paints on different types of stone. Five graffiti spray paints are applied on marble, limestone and granite. After that, they are treated with two laser cleaning setups and the potential of the copper bromide vapour laser for cleaning of graffiti spray paints is demonstrated for the first time.